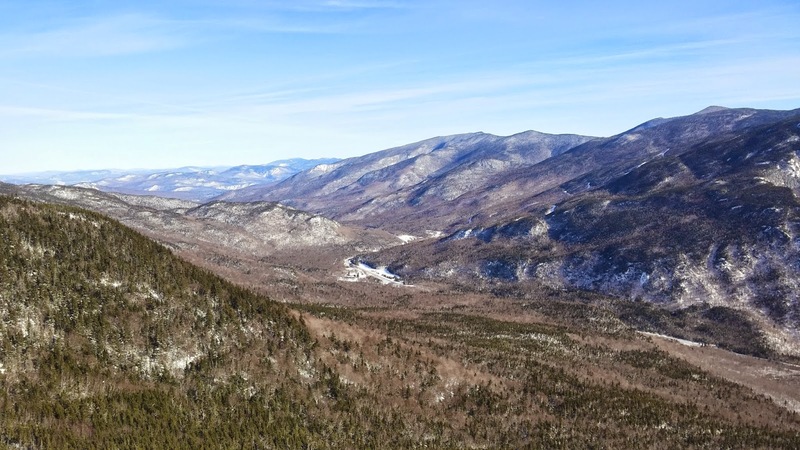 AMC Conditions: White Mountains Snowshoeing! The storm that passed through on Tuesday dropped a nice fluffy cushion on the area, so I figured I’d give the snowshoes a whirl. On Thursday morning, I walked to the south end of the parking lot at the Pinkham Notch Visitor Center and hopped onto The Direttissima. Having taken the same trail to Glen Ellis Falls the previous day, I didn’t have to break trail on The Direttissima. Approaching Glen Boulder, looks so small from here! Fortunately, by a well-timed stroke of luck, fate, mountain karma, or whatever you might call it, I stumbled upon the Thermos that I had dropped the previous day. 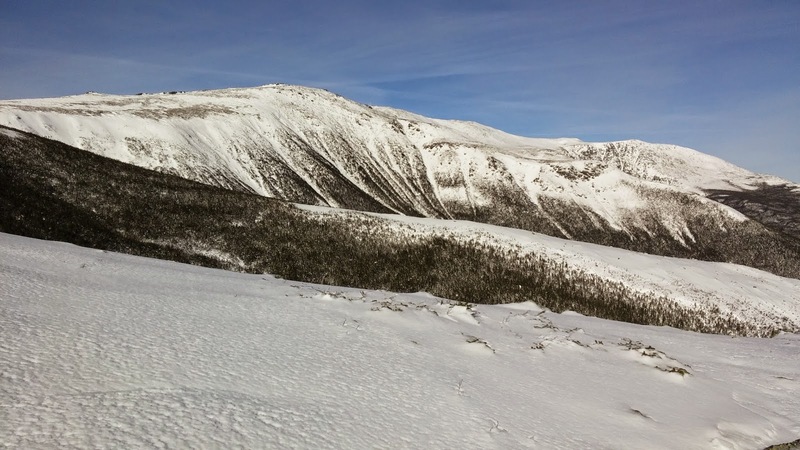 It was an accident – I caught the toe of the snowshoe on something, I pitched forward, the Thermos fell out of the bottle holster of my pack, and got buried when I got back on my feet. But back to the present. I cracked open the Thermos and found that my chicken broth from the previous day was still lukewarm! With soup added to the pack, I had enough fuel to extend my adventure. The original plan was to go as far as Glen Boulder, but now I could explore the trail beyond that. First things first though. Now on the Glen Boulder Trail, I had to break trail for 1.2 miles uphill to get to the boulder. Even though I was sinking anywhere from my shins to my thighs, the snow was light and dry, so breaking trail was not too tiresome. I made sure to remove layers as I warmed up, to keep from dampening my baselayer with sweat. Dry and all souped up, I broke treeline. The terrain was largely wind-swept, leaving a firm crust, but the snowshoes provided adequate traction. 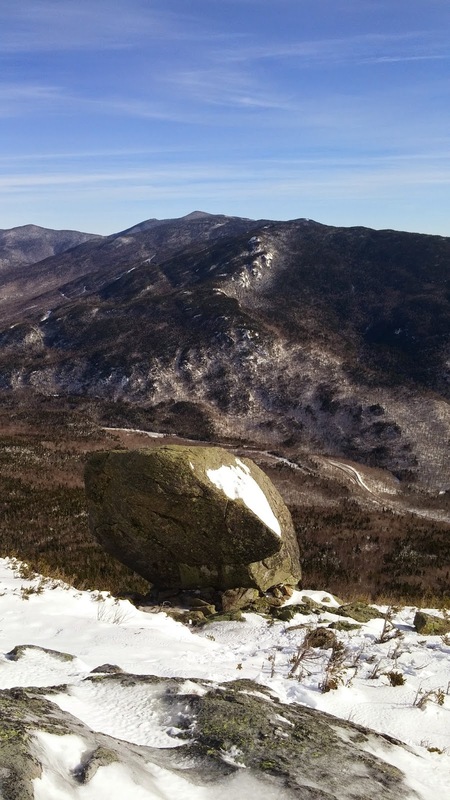 Before long, I could see Glen Boulder, perched precariously on the sideslope. I also made sure to turn around and see the view behind me: a splendid view of the notch, with the visitor center nestled humbly between the Presidential and Carter-Moriah Ranges. I carefully zig-zagged my way up to the boulder, where I stopped for another soup break. The Wildcat Ridge Trail was very pronounced across the notch. I read last week that this is actually the steepest half mile of the 2,185 mile long Appalachian Trail! And it’s right here in our stomping grounds. It was still pretty early, so I continued up the Glen Boulder Trail and followed the cairns toward the bluebird sky. At one point, the snowshoes weren’t digging into the crust to provide traction, so I removed the snowshoes and went with bare boots. I made sure to kick through the crust with each step, since I didn’t have any other traction with me. Note that this is not the recommended way to hike above treeline! Those of you who are smarter than I know better. Take in the view, turn back for the day, and return later with the proper equipment. The mountain isn’t going anywhere. I got lucky this time, and made it past that hairy section. The trail heads back into the trees about half a mile past Glen Boulder, and it was clear that no one had been here in a while. No old postholes, no crampon marks in the crust. 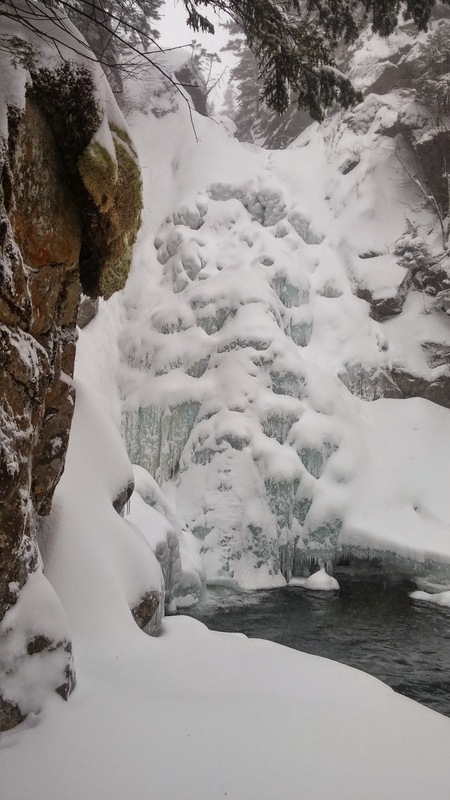 Back in the trees, the snowdrifts were knee to thigh depth – even with the snowshoes. It was harder to follow the trail, and I was constantly ducking under and around snow-laden branches. I climbed above treeline after another half mile and found myself at Slide Peak, also called Gulf Peak. Slide Peak doesn’t meet the criteria to be on New Hampshire’s list of 4000 Footers, but hitting 4,806 feet before noon is still pretty cool. Especially with a 360 degree view of the area on a beautiful day. The way down was much quicker, thanks to broken trail and our friend gravity. I made sure to be super careful on the crusty slab sections, but had some fun in the powder. I did a mix of quick hiking, running, and glissading, all with the snowshoes still strapped to my feet. Not so bad after all. 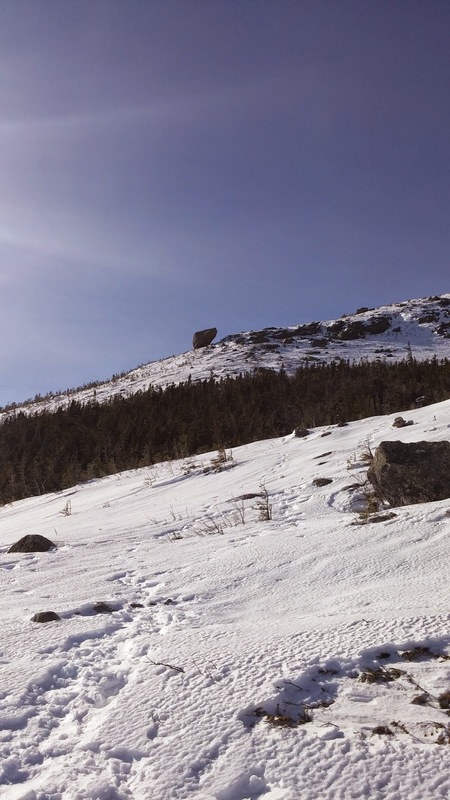 I took the Glen Boulder and Direttissima back down the way I came, and made it back down in time for a well-deserved warm lunch at the Pinkham Notch Visitor Center. Give us a visit this season and come check out the trails! We have snowshoes available to rent, with discounted rates for members. Check out the other perks of becoming a member at the AMC website! Remember your ten essentials! Bring plenty of snacks and liquids, as finding trail soup is not the norm! If you find yourself ill-equipped for the situation, turn back and return with the proper gear later. The mountain isn’t going anywhere. You’ve been in front of the computer long enough, it’s time to go play outside. The AMC also offers and hosts clinics and group trips for ice climbing, avalanche certifications and winter mountaineering. All of our programs for the '14/'15 season can be found on our Activities and Events Page. For any general questions, conditions information, or trail advice, please feel free to contact us here at the Pinkham Notch Visitor Center front desk. We are available by phone at (603) 466-2721 every day from 6:30 AM to 9:00 PM or by email at amcpinkhaminfo@outdoors.org. To make reservations at AMC Lodges and Huts, please call (603) 466-2727 available Monday through Saturday 9am-5pm.